Paperback, 8.5 x 11 in. / 144 pgs / 70 color. Edited by Petra Joos. Text by Rainer Hehl, Franck Leibovici, Pedro Luz, Hannah Monyer, Luiz Alberto Oliveira, Raphaela Platow, Tania Rivera. Though Brazilian artist Ernesto Neto (born 1964) defines himself simply as a sculptor, his works are created as total experiences to be entered, inhabited, felt and even smelled. He states: "What we have in common is more important than what makes us different. I'm interested in discussing the situation of humanity, the temperature and the things we experience." 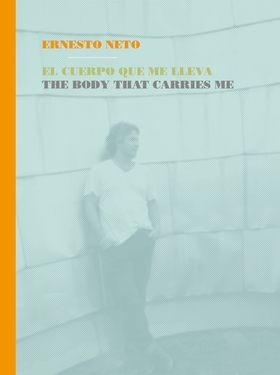 Ernesto Neto: The Body That Carries Me, published to accompany an exhibition at Guggenheim Bilbao developed in close collaboration with the artist, includes an extensive selection of his oeuvre from the end of the 1980s to the present. Some of his previous works have been reconfigured based upon the ideas and wishes of the artist, as well as for Guggenheim Bilbao's specific architecture. Captured beautifully in this volume, Neto's exhibition is a rich realm of smells, colors, emotions, language and sensory happenings. FORMAT: Pbk, 8.5 x 11 in. / 144 pgs / 70 color.